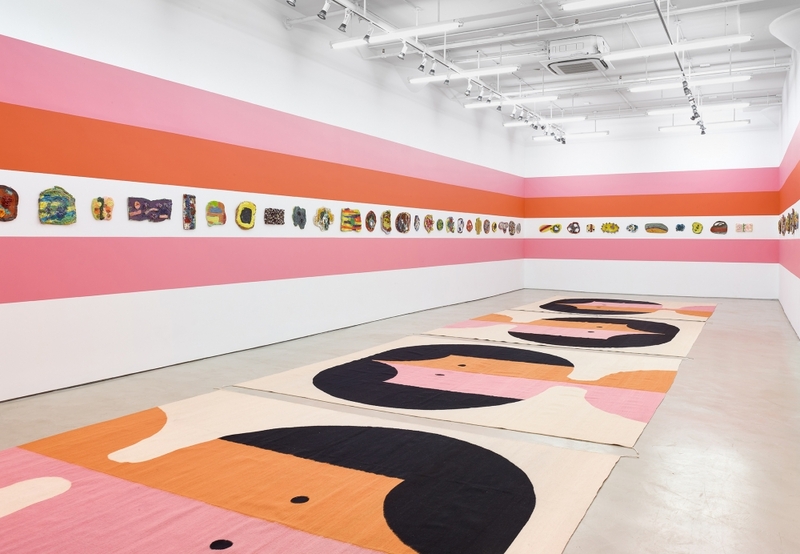 Alexander Gray Associates presents Polly Apfelbaum: The Potential of Women, the artist’s first exhibition at the Gallery. The exhibition features all new work, including gouache drawings, hand-woven rugs, and wall-mounted ceramics. The key visual motif comes from the 1963 book, The Potential of Woman, published in conjunction with a symposium of the same name. Apfelbaum draws inspiration from graphic designer Rudolph deHarek’s cover design for The Potential of Woman, which features a flattened, stylized view of a female figure’s head. Her appropriation of this image, chosen as an icon, is consistent with her ongoing interest in applied design and popular culture. Apfelbaum was also fascinated by the book’s provocative and ultimately patronizing message. The book and its related symposium imagined a future in which women might be useful contributors; Apfelbaum instead reflects the desire for a broader appreciation and empowerment of legions of capable women in the present. In the exhibition’s title, Apfelbaum changes the word ‘woman’ to ‘women’ to reinforce an inclusive communal narrative around feminism. In the second floor Gallery, the artist has created an immersive environment, in which she occupies and transforms the entire space with four rugs, painted walls, and dozens of wall-mounted ceramics. Critic Christopher Knight has described her similarly expansive 2016 installation at Otis College of Art as a “secular chapel of abstract art,” an association that Apfelbaum invites. The rugs, the central element of the installation, deploy deHarek’s graphic design in orange, pink, tan, and black; they were woven in Oaxaca by Zapotec artisans indigenous to the region using their traditional weaving and dying methods. The walls are painted in large horizontal stripes of orange, pink, and white, matching the tones used in the original book cover. Intimately-scaled abstract ceramic portraits are hung around the walls to mimic what the artist describes as a a participatory audience for the work, much like “a Greek Chorus that gives voice to the performance.” Apfelbaum has depicted another crowd of women in polychromatic gouache drawings installed on the ground floor of Gallery. She renders the same face appropriated from the cover of The Potential of Woman in a variety of sizes, and color spectrums, creating a kaleidoscopic effect. Her use of vibrant dense pigment here is a tribute to Josef Albers’ landmark book on color theory, Interaction of Color, also printed in 1963, emblematic of her fusion of of pop-cultural and art historic references. With the recurrent aesthetic of accumulation and diverse color saturations, Apfelbaum expands the visuals of the political landscapes surrounding the 2017 election and its resulting activism. Collectively, her densely populated drawings, row of ceramics, pay homage to the recent resurgent prominence of women’s marches and enforce the power of community to engage in collective action and activism.